Juan P. Hinestroza, a U.S. Fulbright Scholar and a PMP®, is a tenured Associate Professor of Fiber Science and directs The Textiles Nanotechnology Laboratory at the College of Human Ecology of Cornell University in Ithaca, NY. Professor Hinestroza obtained a Ph.D. from the Department of Chemical and Biomolecular Engineering at Tulane University and B.Sc. in Chemical Engineering from Universidad Industrial de Santander. Prior to pursuing doctoral studies, Professor Hinestroza worked as a process control engineer for The Dow Chemical Company, he is the co-founder of 3 start-up companies, and has served as consultant to major Fortune 50 corporations in the field of smart and interactive textiles and fibers. Professor Hinestroza works on understanding fundamental phenomena at the nanoscale that are of relevance to Fiber and Polymer Science. Hinestroza has received over 8.4 MM USD in research funding (Federal and State agencies as well as Industrial Consortiums) for his pioneering work in exploring new pathways for creating multifunctional fibers via manipulation of nanoscale phenomena. Professor Hinestroza has been the recipient of a myriad of awards including the National Science Foundation CAREER Award, the Young Investigator Award from NYSTAR and the Educator of the Year Award from the Society of Professional Hispanic Engineers, The Humanitarian Award from the National Textile Center and the Academic Innovation Award from Cornell Class of 72. Professor Hinestroza has delivered invited lectures worldwide at Universities and Research Centers in Argentina, Australia, Austria, Brazil, Canada, Chile, China, Colombia, Costa Rica, Croatia, Czech Republic, Finland, France, Germany, Guatemala, Honduras, Hungary, India, Israel, Italy, Japan, Mexico, Morocco, New Zealand, Peru, Phillipines, Portugal, Puerto Rico, Romania, Russian Federation, Singapore, Slovenia, South Korea, Spain, Switzerland, Taiwan, Thailand, The Netherlands, Turkey, United Arab Emirates, United Kingdom and Vietnam. In addition, Professor Hinestroza has received visiting scientist fellowships from The Chubu Foundation for Science and Technology in Japan, The National Council for Scientific and Technological Development in Brazil, The Swiss National Science Foundation in Switzerland and the Tote Board in Singapore. Professor Hinestroza’s scientific work has been featured in Nature Nanotechnology, MRS Bulletin, Materials Today, C&E News, National Geographic, ASEE Prism as well as mainstream media outlets such as CNN, Wired, TechReview, The Guardian, Popular Science, ABC News, NYTimes, Reuters, PBS, NPR and BBC. 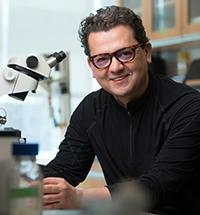 In addition to his scientific endeavors, Professor Hinestroza and his research group are actively involved in community outreach activities aimed at increasing the number of members from underrepresented minority groups in Science, Technology, Engineering and Mathematics as well as engaging senior citizens in collaborative and inter-generational learning experiences. The main focus of the Hinestroza Research Group is to explore the interface between the technologically established and mature field of textile science with the emerging and revolutionary field of nanoscale science. The field of textiles was the first beneficiary of the scientific developments from the 18th century's industrial revolution while the nanotechnology revolution emerged the end of the 20th century. Our research group aims at merging two hundred years of innovation history. We believe that this unusual combination, between an established and an emerging scientific field, can provide unique scientific platforms that take advantage of the ability of nanoscale science for controlling the synthesis of materials with the time-tested capabilities of textile and fiber manufacturing. In order to explore and understand nanoscale phenomena of relevance to fiber science we decided to pursue a three-pronged approach: The first branch is aimed at modifying the properties of existing textile products, specifically natural fibers, using nanomaterials. The second approach is aimed at creating novel nanofiber based materials by taking advantage of unique self and directed assembly phenomena. The third effort is aimed at developing metrology and computer simulation tools to better understand traditional issues in textile processing such as friction and electrostatic charging whose influence is magnified at the nanoscale. These three efforts are highly complementary and when combined they are expected to provide a more comprehensive understanding of nanoscale phenomena relevant fiber science. Ozer, R., Hinestroza, JP., One-step growth of isoreticular luminescent metal-organic frameworks on cotton fibers, RSC Advances (2015), 5 ,20, 15198-15204. Chacon-Patino, M., Blanco-Tirado, C., Hinestroza, JP., Combariza, MY., Biocomposite of nanostructured MnO2 and Fique fibers for efficient dye degradation Green Chemistry (2013), 15, 2920-2928. Nolasco-Arizmendi, V., Morales-Luckie,R., Sánchez-Mendieta, V., Hinestroza, JP., Castro-Longoria, E., Vilchis-Nestor, AR, Formation of silk-gold nanocomposite fabric using grapefruit aqueous extract, Textile Research Journal (2013), 83, 12, 1229-1235. Yu J-Y, Zheng N, Mane G, Min KA, Hinestroza JP, Zhu, H., Stringer, K., Rosania, G., A Cell-based Computational Modeling Approach for Developing Site-Directed Molecular Probes. PLoS Comput Biol (2012), 8,2: e1002378. Professor Hinestroza is a member of the Division of Cellulose and Renewable Materials of the American Chemical Society. Hinestroza is also a member of the Project Management Institute, The Society of Materials Research MRS, The American Institute of Chemical Engineers AICHE, The Fiber Society and The Society of Hispanic Professional Engineers SHPE. Professor Hinestroza is a Cornell University Faculty Senator and a member of the grievance committee of Cornell's College of Human Ecology.